Li-en is the daughter of Li-Akron in Hong Kong. Her father had broken up every relationship that Li-en ever had on purpose. She said, "Every guy I dated left me as soon as they found out who you are." The reason I think her father does this is because he's protective of his daughter. Won Rei however, didn't leave her. She teaches Won Rei martial arts to make him unbeatable, and she stays with Won Rei. Li-en also treats Won Rei's wounds. One day, she finds out that Won Rei wants to stop fighting because he didn't want her to get hurt. She goes to her father, and Li-Akron tells her, "He's in a jail miles south of here... on Yougan Island. His cell is atop rugged mountains, and I've sent several employees as security guards." She gets sent to Japan to her grandma's house. While in Japan, he escapes from two employees of her father. 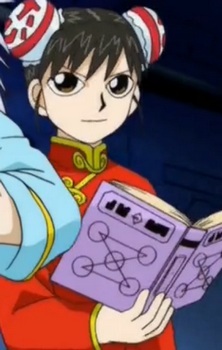 She sees a spell book, and steals it from Kiyo. She does apologize to Kiyo, and asks for his help to save Won Rei. While waiting for the boy with the red book (Kiyo), the two employees caught up with her. The Zaker spell, Zatch's first spell, shocks the same two. Kiyo and Zatch help Li-en get to Won Rei, but a mamodo named Zabas, and his human partner were at the top of the mountain. She gets to the cell that Won Rei is in, and eventually she admits that she loves Won Rei. Won Rei told her to go home, but she stands in front of the cell. Won Rei also told her to move, and she says, "What's wrong Won Rei? You said you didn't love me...so why are you worried about me?" Zabas called Li-en worthless, and when Won Rei got out of the cell by the Go Boren spell, Won Rei wanted to send Zabas back to the mamodo world. After Zabas gets knocked out, Won Rei carries her towards the boat, and they see Li-en's father. Li-en's father let his daughter go with Won Rei. Later on in the series, they run into Dr. Riddles. The anime shows it quite quick. Also when they get to South America, they meet Tia, Kanchome, Ponygon, and Zatch. The last time I have seen Li-en and Won Rei they were in the ruins with Tia and Megumi.